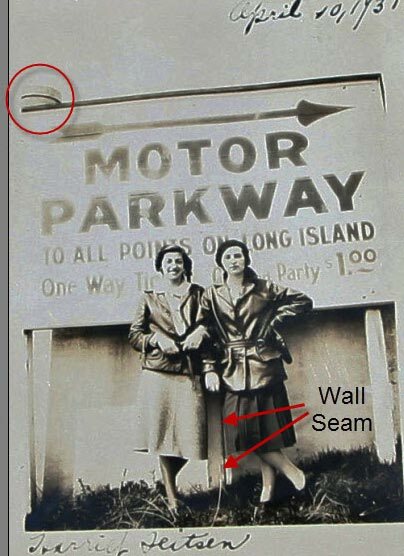 As a follow-up to last Wednesday's post concerning a 1931 Motor Parkway sign photo provided by Bill Schwartzberg, the CSI (Cup Scene Investigation) Team has been dispatched to analyze the submitted evidence. 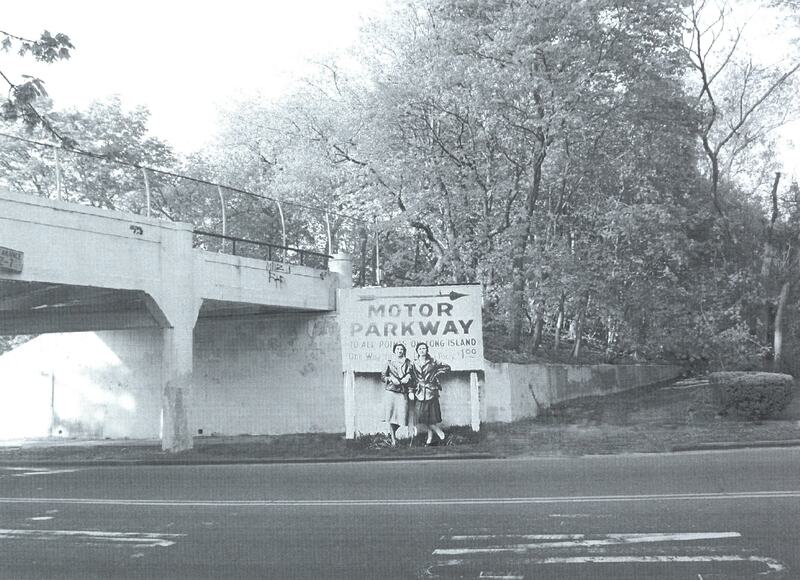 Bruce Adams, Mitch Kaften and my favorite co-author Al Velocci believe the two women are were to the left of the Springfield Boulevard Queens entrance of the Motor Parkway. As seen in this current photo, the entrance ramp is still there. Gary Hammond noted that missing copy probably read;"One Way Ticket Car and Party $1.00" and, based on Census data, one of the woman may be Harriet Feitsen. 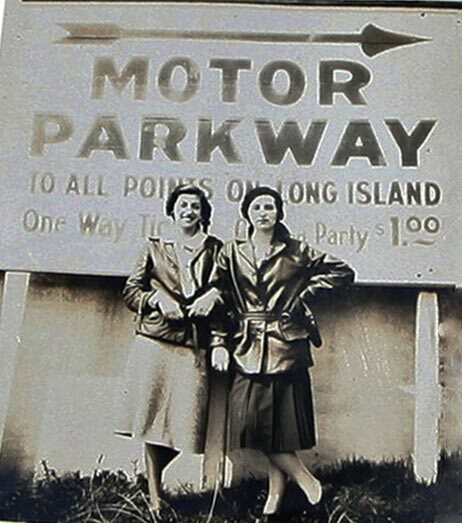 Eagle-eyed Al spotted the round structure above the sign and concluded; "The ladies are standing in front of the southeast embankment wall of the Rocky Hill Rd./Springfield Blvd. entrance to the Parkway." In comparison with the 2012 photo, Al is 100% correct. 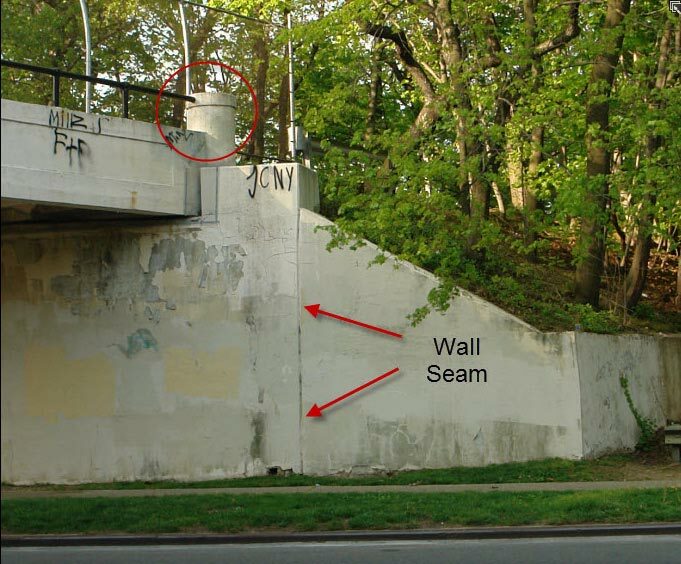 Moreover, I observed the similar seam on the concrete walls in both photos. With the great assistance of loyal VanderbiltCupRaces.com viewers, the CSI Team concludes the two women were standing in front of a sign placed at the Motor Parkway entrance at Springfield Boulevard. Using the miracle of Photoshop, this is how the sign likely looked at the bridge in 1931. You guys are just too good at this. No word on where they got those amazing leather jackets? That’s OK. I’m still quite impressed. I’m going to take a ride there today and do a bit of photoshop work with my imagination. THANKS! I LIVE IN THE AREA NEAR THE START OF THE MOTOR PARKWAY. I FREQUENTLY PASS UNDER THE BRIDGE ON SPRINGFIELD BLVD. I NOTICED THE RAMP BUT NEVER INVESTIGATED IT. DOES IT STILL CONNECT INTO THE PARKWAY? 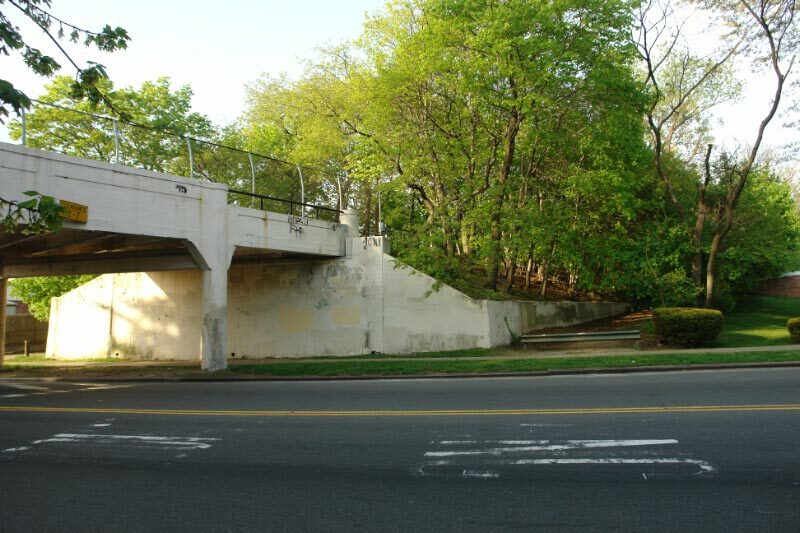 Gene, the two ramps on Springfield Boulevard lead to the Queens Greenway bike path on the right-of-way of the Long Island Motor Parkway. No tolls necessary! Howard, hats off to csi with their investigation however, two things. 1. I bike through there often and couldn’t resist to check out the corner. I believe the sign was up against the 5 foot high adjacent wall that faces south. There too is a vertical seam about 9 feet from the corner. I believe this is correct because there is no wall behind the sign in the picture with the pretty ladies The circular object is high up on the bridge. The other wall parallel to Rocky Road is higher with a 45 degree cut that would have been revealed in the photo. Also in this location, the arrow in the sign would’ve pointed directly towards the entrance ramp.